In the absence of new bots all this smells like hack - the rewards have not changed. 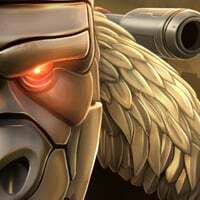 I am shocked that the rewards aren’t higher than last month considering we aren’t getting any new bots. Especially since the Double Crystal Bounty and Bee Arena are ending. The game is going to feel slow and boring starting tomorrow. If I was Kabam, I’d be doing something to get the customers excited (and stay excited). 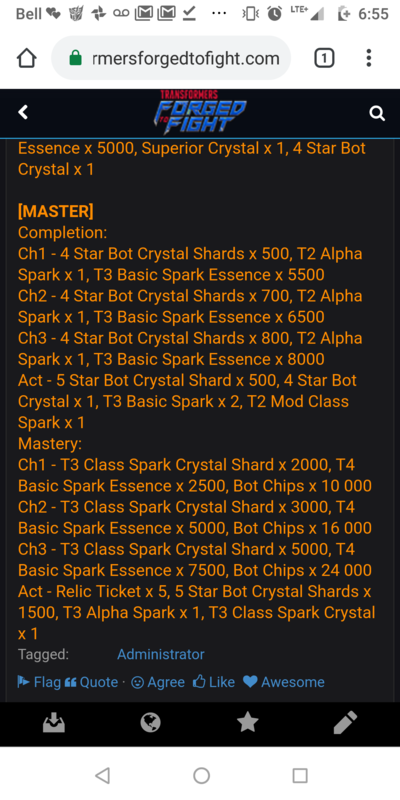 Not saying they shouldn't increase but we've got a week of double crystal bounty anyway, mounting to a lot more chips. Now I'm more worried if there are three seperate Monthly objectives (Get a 5* Bludgeon/MM/Jazz) to complete all. Sadly yes, there are 3 separate monthly objectives. Uhm, What rewards are updated? these are the same as last months. Last MONTH, singular. The upgraded rewards for the exchange of Minibosses. The minibosses are barely a challenge, but I'm not gonna argue. I’ve actually never played this one, but I heard Megs isn’t too much of a challenge. Ignoring the mods, Megatron should be pretty easy, as long as you can dodge well. You need to back out immediately when he becomes Unstoppable, know how to dodge his heavy well, and be able to dodge to bait out his special one/two. His special three, namely the Fusion Overload, is surprisingly powerful. Or you can just use a duped Starscream to fight him, and just nullify everything, which is what I will do. This right here proves why I always thought G1 Megatron was a disappointment. This actually created somewhat respect of those in bayformers who died got slaughtered by humans, and yeah there was prime too who gave the final punch to them. Is it the same story dialog for the missions? Poor G1 Megatron, to me, was wasted potential. He always made the dumbest decisions like building a giant purple griffin, not making sure the Autobots were dead (multiple times), and keeping Starscream alive. Heck, he never gave a reason for why he let Starscream live. He was incompetent for the sake of the plot and that bothered me, especially when he retreats in Every. Single. Episode. Some times are reasonable, but most times it's only because a device he builds doesn't work or because some humans show up. When I first saw this I was like "Isn't retreating Starscream's thing? 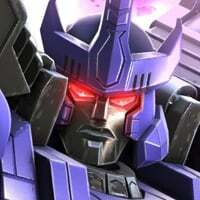 Most Megatrons will stay in the battle till the end, but this Megs just retreats every 5 seconds." And the sad thing is that in the Pilot episodes, he actually was competent and menacing, but he slowly became a doofus as the series went on. Then his motivation: he wants to save Cybertron, but sometimes he barely shows concern for it, sometimes he just wants to rule the universe like some other Saturay Morning Cartoon Villain. And did they ever specify on why he started the Great War? I apologize for ranting but i despised the way the writers wrote Megatron in the G1 show and I just finally want to express that. Well at the very least he becomes a thousand times more competent in the G1 animated movie; actually conquering Cybertron, slaughtering Autobots and killing Optimus. If only the show made him as menacing as he was in the movie. imho, I liked Galvatron as a character more. 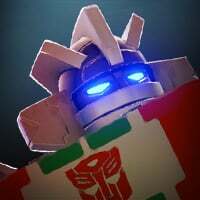 I would say why, but I have stuff to do, so expect a comment about me prasing our glorious lord and savior Galvatron later. Why not a new bot!? Couldn't they skirt the law and release color swapped characters from existing models? If we want G2 colored bots I want to ask for a paint program within the game and we color our own bots. G2 had some funky colored bots. Sure let me paint Optimus Prime white, there's your cab only Ultra Magnus. In any case, I am playing this spotlight mission since I missed it the first time around. Looks like we have mini-bosses in this rehash of the Megatron Mission. So far, the 1.1 miniboss is Dinobot, the 1.2 miniboss is Kickback, & the 2.1 miniboss is Ramjet. 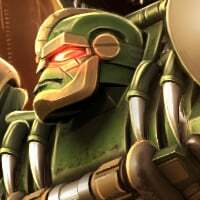 We’ll see how the rest of the Spotlight Missions play out, but I assume the 3.2 Miniboss will be ROTF Megatron. So, allow me to ask a question. Was it not a few months ago we were told that the spotlight missions difficulty would be lowered? Now we have this new "Mini boss" added to the missions, effectively making the spotlight missions harder. Why was there no substantial rewards given to make up for this? Hell, it could have been 250 T3 class shards for beating the mini boss or T3 Class essence based on the class of bot you beat. Rewards was increased with the introduction of mini bosses in the last spotlight. You expect them to increase it again because they're keeping the mini bosses? i don't remember them recently saying spotlight difficulty was going to be lower. the last time was when they added the Master level (to adjust for Master). It doesn't seem like an even trade off, and it didn't seem like one last month either. Just a little extra, I am sure that wouldn't hurt. @Manthro See? I told you he rather have t3a essence instead of a t3a spark. 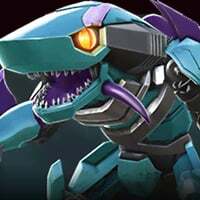 2.2 is Scorponok, 3.1 is Arcee, and 3.2 is ROTF Megs. I remember Arcee has shock block and ROTF resistance for mods.